Editor’s Note: This article first appeared at the author’s blog, available here and reprinted with permission. Winning $50,000 at TechCrunch 50 last night, Yammer did what Twitter hasn’t been able to: create a simple solution for enterprise with a pre-defined business model. Founded by David Sacks, former COO of PayPal and currently CEO of Geni.com, the management team is filled from the ranks of PayPal, eBay, eGroups and Tribe. Sacks wanted an enterprise version of Twitter to keep his company connected, but it didn’t exist. 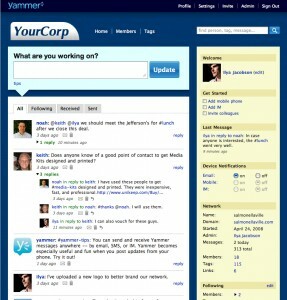 So they built Yammer and launched it at TechCrunch 50 on September 8, 2008. As of the morning of the 10th, over 2,000 companies and 10,000 users were registered with Yammer. Anyone in a company can be the first to start a Yammer network for free and answer the question “What are you working on?” They just need a valid company email address and then begin inviting others from the enterprise to join the network. They say this means that “Yammer can spread virally through a company like a consumer social network.” For some company cultures, this may represent lack of control over internal communications and be seen as a threat if it is not initiated from the top-down. Yammer would likely be a hard sell to be endorsed by management in those types of enterprises. There is no need for an enterprise-wide IT software installation as the service is hosted by Yammer. However, employees wishing to use the Yammer desktop application will have to download the app and have Adobe AIR installed, leaving the possibility for a spike in IT support calls. Users can also send and receive messages using an iPhone application, blackberry application, IM, SMS or email. You can also subscribe to email daily digests of network activity. Many of Yammer’s features function similarly to Twitter. There are some great improvements and a few misses. Firstly, Yammer’s enterprise networks are established using the domain extension of the person’s company email address used to register the account. This could become complicated for organizations that use multiple domains over their divisions, as only those with the same extensions would be grouped into a network, making collaboration on Yammer between divisions impossible. The profile information on Yammer is more robust than Twitter, showing your messages, list of people and tags that you follow, your contact information, and your place in the organizational chart, which maps relationships through the network. The familiar tabs of All, Following, Received and Sent are used in the interface. Unlike Twitter, there is no public timeline, or as Yammer calls them, feeds. The All tab represents everyone in your organization using Yammer and there is no access to feeds of other organizations. A great feature is the ability to follow people or tags. Working on a project? Following its #tag will put all associated updates in your Follow tab. In the message body, typing # produces a drop down list of previously used tags to simplify and reduce redundancy, with an auto-suggest function. You can also view tags in your network by tag cloud. You reply to a message using the provided reply link or with “re:name” at the beginning of your message. For those used to the Twitter-style @name reply, this could be confusing. By clicking on the “In Reply To” link, you can view the entire threaded conversation. The feed can be shown in “message view” or “threaded view”, giving the number of replies and people in thread via a “disclosure triangle” that expands and collapses. Messages contain tag, member and reply links, in addition to a link to forward the message to your email address or view the message within the context of the threaded conversation. I was unable to determine if there was a character limit on updates. Use @name to address someone directly anywhere in your update. Typing @ gives you a dropdown list with auto-suggest as you type, a feature that I wish Twitter would offer. Another useful feature is a links directory which shows every link posted in messages, complete with who posted it, when, its title and any related tags. You can also view links by tag or member making it easy to pinpoint information related to a project. Search for people, tags or words and phrases in messages. Again, there’s the handy auto-suggest function and linked shortcuts. Searching on a word or phrase gives results in 3 tabs: messages with the result; members whose name matches the word; tags that match the word. Yammer has gone to lengths to explain and describe how its service works and to engage its community with a help center FAQ, a user forum, an extensive How To Guide, a video tour and a blog, as well as a prominent Feedback Form side tab. These measures will go a long way to adoption, especially in enterprises whose employees are not likely to be familiar with Twitter. You can customize how you want updates to appear, whether to show full names instead of user names and employ absolute time stamps for enterprises operating across multiple time zones. It is possible to upload the company logo to appear on each page in your network, but at this point it is not possible to skin the interface to match your brand’s look and feel. I was surprised that Yammer has not employed RSS, nor is there the ability to send a file through the system, as you can with Pownce. In the future, I can see that there will be demand for a white label solution that can be internally hosted, giving enterprises ultimate control over their own data and security. Overall, I give Yammer high marks for building in some great features that clearly shows knowledge of the needs and challenges of enterprise users. What remains to be seen is how readily enterprises will embrace Yammer as part of their company culture. Do you think that enterprise is ready for Yammer? Let me know what you think. See Yammer’s pitch at TechCrunch 50. See Yammer win at TechCrunch 50. UPDATE: Laura Fitton of Pistachio Consulting gave me the heads up that moments after Yammer won the TechCrunch 50 prize, Oracle announced it’s new enterprise microblogging plaftorm, OraTweet. Her post on OraTweet is here. Adele McAlear is a Montreal-based marketer who loves social media and technology. With 18 years marketing experience, she believes that social media is only one driver in the marketing toolbox. She blogs at Marketing Monster.